The Fellowes Jupiter2 125 pouch laminator is for frequent office use. 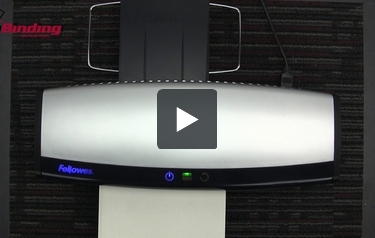 With a 12-1/2" entry width, the Fellowes Jupiter2 125 laminator can handle a variety of laminating applications. The carrier-free, 6-roller laminating system ensures high quality lamination for both documents and photos. The Fellowes Jupiter2 125 includes four heat settings for laminating pouches up to 10mil thick and it can also perform cold lamination for laminating heat-sensitive materials in self-adhesive Selfseal pouches. The Jupiter2 125 is ready for heated lamination in 60 seconds and finishes letter size documents in just over thirty seconds. With a green light and audible beep signal it is easy to tell when the laminator is ready. The Jupiter2 125 has a reverse mode to disengage pouches for re-centering or removal, and auto shut-off prevents overheating when not in use. Plus, the Fellowes Jupiter2 125 is one of the only laminators available on the market that allows for easy access of the rollers for cleaning, maintenance, or removal of misfed sheets. Essential pouch laminator for the office. Rapid laminating speed up to 30" per minute. Pouch laminating machine comes with 2-year warranty. Laminating Speed (inches p/min):	Up to 30"
So far I am loving the machine, it is very easy to use, no complaints yet! This is so much nicer than what I expected! I love this laminator! I was able to hammer out 100 badges in 40 min and some of that time was just me placing the badge into the pouch. It’s heavy duty and definitely worth purchasing. I am a very happy customer. I love this machine! Works like a charm! Love that it is so functional. It accommodates multiple sizes and thicknesses. Allows a carrier sheet although they are not required! Will do hot or cold laminating. Also has a cool down method of shut off to assist in keeping your machine in pristine running order long into the future! I really love this laminator. It is performing exactly as I had hoped. No air bubbles or ripples. Am using for craft projects. Excellent laminating machine however the control buttons are somewhat confusing. I laminated my own instructions for use for the other office workers. The customer service was great in helping me decide to go with this laminator. I'm happy with the performance. Thanks again! This is the best, most versatile laminator that I've ever used. Works flawlessly on documents from business cards to 11"x17" posters and from 3 mil to 10 mil film weights. Also, a great price from MyBinding.com. Very easy to use. Like the way that it stays cool to the touch on the outside so that I don't burn my hand. Hello and welcome to MyBinding video. Let's check out the all new Jupiter 2 125 by Fellowes. This is a pouch laminator newly redesigned. It has a large 12 ½" throat opening so large documents are easily laminated. The simple controls are on top and touchpad. It has an automatic sensor so it adjusts the heat and rolling speed for your thickness of pouch. The Jupiter 2 does not require that you use a pouch carrier, however here at MyBinding.com we highly recommend the use of carriers to prolong the life of any pouch laminators. When the machine is powered on and stops blinking, you can simply slide your document in with the crease end in first. It runs at a max speed of 30 inches per minute. It can handle pouch thicknesses up to 10 mil and warms up in just 60 seconds. It's great for documents, affidavits, small items such as cards or ID badges. It can handle regular paper as well as cardstock because of its automatic thickness selection and because of its cold lamination abilities; it's great for photos and other heat sensitive documents. It has a built in reverse button should there be a jam. Just press, hold and remove. Fellowes has made a great line of slick pouch laminators and the Jupiter 2 newly redesigned is even better. For more demos, reviews and how to's, check out MyBinding.com. (inches p/min) Up to 30" Up to 43" Up to 24" Up to 19" Up to 19"
Can the Jupitor 2 125 laminator work on 11" x 17" paper as well? Thank you for your question. The Fellowes Jupiter2 125 Pouch Laminator would be able to work with the Menu Sized (11"x17") pouches. You would feed the 11" side into the opening. The Fellowes Jupiter2 125 Pouch Laminator has a 12.5" wide opening. We have the Fellowes Jupiter 2 - 125 at our work place. Somehow the sheet you run through the machine after you are done laminating has disappeared. How can I get a replacement sheet?? Thank you for your question. We have the Fellowes Laminator Cleaning Sheets available here . Could you tell me what temperature the fellowes jupiter2 125 heats up to? I emailed earlier in the week, and I am looking for a laminator to do gold foil projects. I know I can't manually choose the temperature on this laminator. Thank you for you question. We confirmed with Fellow that the maximum temperature that the is runs at Fellowes Jupiter2 125 Pouch Laminator is 268 Degrees Fahrenheit.. Most laminators that can process a 10 mil pouch get hot enough to work with the foil lamination. The Fellowes Jupiter2 125 Pouch Laminator will work with the lamination foil. I See that you can do big pouches and up to 3 Mil, I am doing smaller then that most of the time will that hurt it? This unit can actually be used with laminating pouches up to 10mil thick and with a 12.5" wide opening it can be used for very small items (like business cards) or very large items such as menus. Technically it does not require the use of a carrier. However, we always recommend using a carrier to prevent pouch jams and to keep your laminator clean.